MIKE CLARK gained worldwide recognition as one of America’s foremost jazz and funk drummers while playing with the Headhunters band headed by Herbie Hancock in the early 1970’s. Mike became known as a major innovator through his incisive playing on Hancock’s album ‘Thrust’ (1974), and particularly the song “Actual Proof”, which is often cited as one of the finest examples of the linear funk style of drumming. This has garnered Clark an international cult following. At the tail end of the 1970‘s and in 1980, shortly before moving to New York City, Mike did a short but remarkable stint with Brand X, the acclaimed British fusion band founded by Phil Collins, doing two tours and recording their seminal albums ‘Do They Hurt?’ and ‘Product’. Clark has also performed with many top musicians from the worlds of jazz and funk, including Chet Baker, Vince Guaraldi, Fred Wesley, Michael Wolff, Les Claypool, and Charlie Hunter. 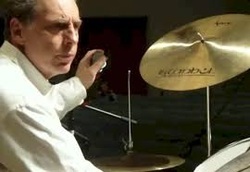 Clark is also known as one of the most sampled drummers in contemporary music. His beats have appeared on records by Prince, NWA, De La Soul, and Janet Jackson, among others.